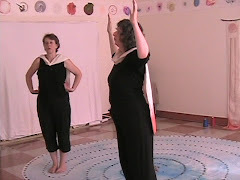 Voicing the Stones is a performance ritual conceived & performed by Wende Bartley & Barbara Bickel on July 30, 2007 at Gibraltar Point Center for the Arts on the Toronto Island. A performance ritual is the manifestation of art and spirit through our bodies. 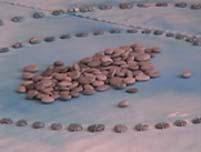 Voicing the Stones took place on a floor labyrinth in the design of a stone labyrinth from Southern India called Chakra-vyuha. 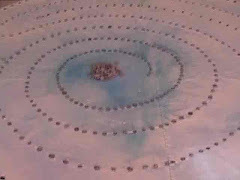 Made from lake stones sewn onto canvas, the labyrinth was created by Barbara Bickel during a month residency at Gibraltar Point Center for the Arts, Toronto Island in July, 2007. To create the ritual, we used the process of "trance". Trance can be described as a form of active meditation, a waking dream state, where one can journey to other realities through an altered state of consciousness. This performance ritual emerged from a trance accompanied by Wende’s music. The music for the labyrinth ritual was created from vocal improvisations and soundscape recordings made in Greece on the islands of Crete and Patmos in the fall of 2004. Most of the recordings you hear in Voicing the Stones were made in Skoteino Cave, an immense cavern of stone that descends 5 levels down into the earth. Caves on Crete were sacred to the Goddess, and symbolic of returning to the womb. Descending down into the stone chambers, the sounds of the bats and pigeon wings welcomed me. As I began sounding into the cave walls, I felt a welcoming embrace. Close by stood a large stalagmite that looked like the figure of a woman. Other recordings were made on the Acropolis Hill on the island of Patmos, and the cicadas and closing voices are from the Phaistos Temple site in the southern part of Crete. The sonic journey begins by the water’s edge and takes the listener down over the rocks and stones to meet whatever or whoever awaits. The voices encountered there enter into the cellular structure and awaken memories, awaken the sensory body, creating a reconnection with the power of the earth. Leaving the cave, the listener travels up and out into the windy expanse of the mountainside. Long forgotten voices merge with the ever-present soundscape of the cicadas. The reunion of voice, body, earth and water. This collaboration between Wende Bartley and Barbara Bickel came as a result of our ongoing conversation about labyrinths, performance ritual and our journies as women artists with a conscious desire to invoke the sacred feminine in our artistic practice. Labyrinths are a potent symbol in many cultures and can be traced back some 4000 years to the late Neolithic and early Bronze Age. A labyrinth can represent a metaphor for the life journey. 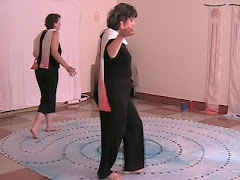 By following the pattern, you effortlessly wind and spiral your way toward the center. Reflect for a moment or an hour, then wind your way back out. The mystery unfolds through walking.